If you’re fresh out of college, or you live alone, chances are you don’t have too much stuff to worry about. But if you’re a family of five, you’re going to need all the help you can get. Do some cost-benefit analysis when deciding if it’s worth hiring a crew to help you with your move, or if it would be more cost-effective to do as much as you can on your own. Though, to be honest, it might be worth it to just shell out the extra cash and let someone else do all the heavy lifting! Even in my tiny little apartment, I can pinpoint a ton of stuff that I simply don’t need. It’s one thing to be a packrat when you’ve settled down into a home, but it’s another to bring a bunch of extraneous possessions along with you when you make a move. Use the six-month rule: If you haven’t used it, touched it, or even thought of it in six months, get rid of it. But don’t just throw it away. Throw a packing party and allow your friends to take the extra stuff off your hands. If anything’s left over, donate it. Don’t pretend you “need it,” especially if it’s been collecting dust in the corner for years. It’ll be less to carry, and will go to someone who actually does need it. Once you’re content with having given away your extraneous possessions, make a list of everything you do plan to bring along with you. Don’t be insanely specific (ex: List “DVDs” instead of every single one of your DVDs), but don’t just go by memory. Take a few laps through the house and make sure you didn’t forget anything. List the order in which you’re going to pack everything, with the heaviest items being first on the list. And definitely don’t forget to make a “First Night List;” you’re going to need to take a shower when the day is done. Once you know what you’re going to bring with you, start packing! If you don’t have boxes, head to the nearest liquor store and see if they have any extras (and grab a bottle of wine while you’re at it—you’ll need it later!). When packing, make sure to mark each side and the top of your box immediately, and definitely before you tape it shut. It would even help to put a copy of your checklist on each box, marking off specifically what’s enclosed in each. 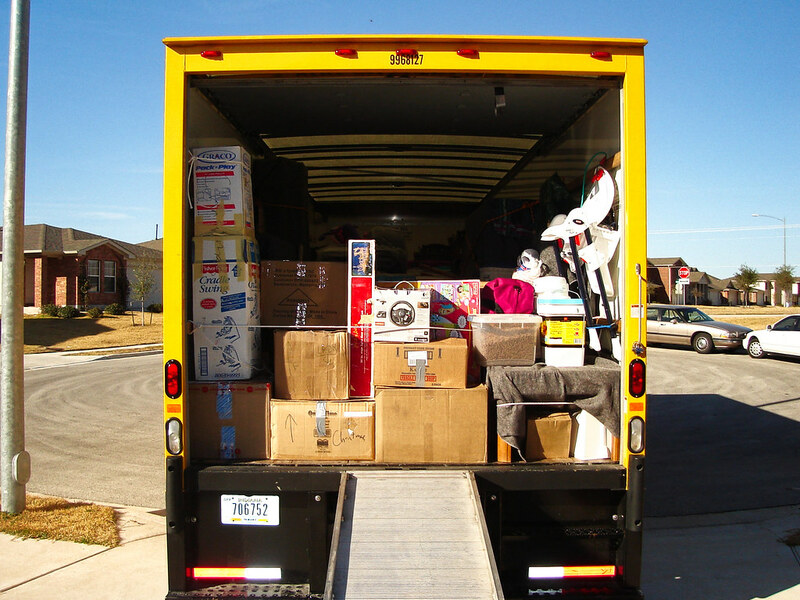 When loading the truck, do your best to pack items from each room together; living room, kitchen, kids’ rooms, etc. That way you’re not pulling apart the entire load to get to your dinette set or your toiletries. While you load up the truck, pack everything as tightly as possible. This will not only maximize the possibility that you’ll get everything stowed away in one trip, but also will ensure that fragile items don’t bounce around along the way. When you get to your new place of residence, you might be tempted to take a short rest. Do your best to power through and get everything off the truck as soon as possible. Once you have everything inside your new home, feel free to take a quick nap on your couch before you start unpacking and preparing for the next step in your life!